Was the 2016 Election Stolen? – Upcoming NoLiesRadio Livestream Promo Video – BERKELEY CALLING BLOG Sept 25, 2018 by Vic Sadot. Was the 2016 Election Stolen? NoLiesRadio will livestream on Saturday, October 6, 2018 at 3 PM Eastern/Noon Pacific times. The livestream will feature commentary and a Q&A session with three leading published scholars on fundamental problems with the US electoral system: Mark Crispin Miller, Jonathan Simon, and Robert Fitrakis. Join the Livestream or read about it here: No Lies Radio “Stolen Election” Forum http://noliesradio.org/stolenelection Was the 2016 Election Stolen? NoLiesRadio 10 06 18 Livestream Promo (4 m 35) Truth Troubadour YouTube Channel Featuring Vic Sadot singing Ray Korona’s “Votes on Paper”. Watch the Livestream Promo now! No, the video does not support Clinton, Trump, or Sanders. The 2016 Election was actually stolen from “We The People” because we were limited to two terrible choices that both work against our interests! Vic Sadot “Truth Troubadour” CD Party Posts Two Live Videos of the Event! Here are the two YouTube videos for the two sets from the “Truth Troubadour” CD release party concert by Vic Sadot on 6-10-17 at Redwood Gardens in Berkeley, CA. Enjoy! Share too please! 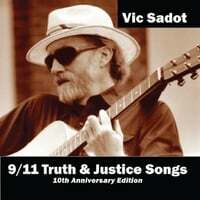 Truth Troubadour – An 18 Song CD by Vic Sadot at CD Baby! This is Vic’s 4th CD at CD Baby! Listen to… Read More Vic Sadot “Truth Troubadour” CD Party Posts Two Live Videos of the Event! Truth Troubadour CD Ready for Review! Five years in the making since Vic’s last CD in 2011, Truth Troubadour CD by Vic Sadot and the 18 songs on the disc were posted at CD Baby on Dec 2, 2016. The 300 LTD run pressed CD’s arrived at my place in Berkeley on Dec 13, 2016. Here’s a photo of me with… Read More Truth Troubadour CD Ready for Review!